Affluent investors have ideas about what to do with their investable assets, and those who do not have advisors often act upon those ideas. Hopefully, they did some research before they made decisions, but many investors do not employ the services of an advisor to help with those important choices. One of the major decisions an investor gets to make over time is what to do with their assets from a 401(k) or employer-sponsored retirement plan. This eventual rollover of assets can go in many different directions, and for many investors, the rollover decision will play a huge role in the availability and supply of retirement assets. Spectrem’s new study on investors and their rollovers tell the tale of how Millionaire investors with a rollover of $800,000 or more moved their funds from one place to another, and whether they used an advisor to perform the transaction. But the study – The Million Dollar Rollover Opportunity – also surveyed investors who have not yet performed the task of rolling defined contribution account funds into individual retirement accounts to see what they were planning to do with their funds. The Millionaire Dollar Rollover Opportunity represents responses from two groups of investors: those with at least $1 million in net worth who have rolled over at least $800,000 from a DC plan into an IRA or another plan within the last two years, and those with at least $1 million in net worth who intend to rollover the same amount within the next two years. Among those investors who have not yet completed the transaction, 51 percent said they have either discussed the topic with their financial advisor or plan to do so. That means half of that group plans to make the rollover without benefit of a professional advisor. Twenty-three percent said they plan to forego all conversation (with spouses, advisors or other family members) and perform the rollover on their own. The good news is that those who have yet to roll over their accounts have put in time to consider their options. Seventy-nine percent said they began the process of educating themselves on the details years ago. Six percent of those who are fewer than two years away from rolling over their assets have yet to consider their options, which is probably not the best idea in order to achieve the best financial outcome. 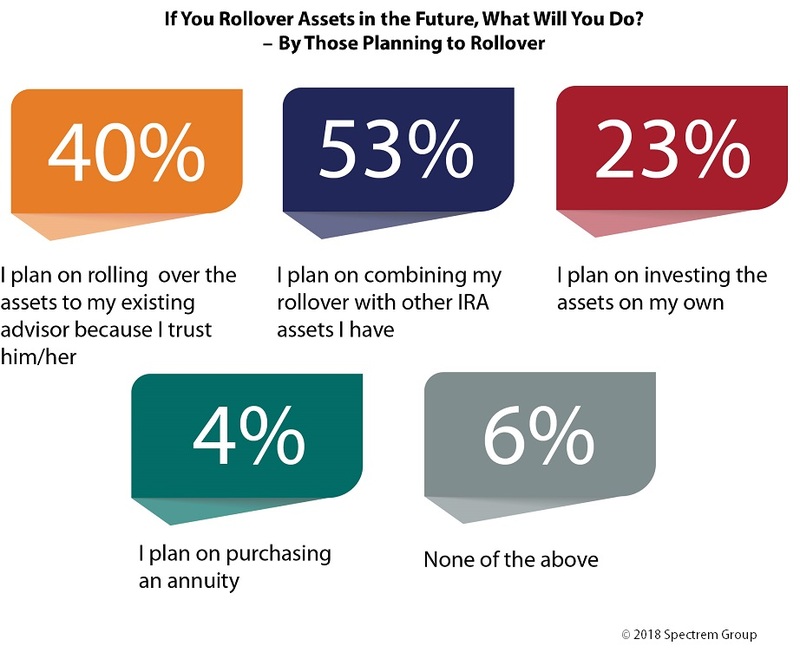 Just over half of those with a rollover in their future intend to combine their assets from the rollover with other assets they have rather than create new accounts. Forty percent said they would turn the assets over to their existing advisor for investing, while 23 percent plan to invest those assets on their own as part of their rollover maneuvers. There is no such thing as being too early to introduce the topic of rolling over 401(k) assets. Most affluent investors plan to retire and a rollover into an IRA is the usual way defined contribution plan assets are moved. An investor who is still years away from making a rollover decision would probably appreciate the forethought that goes into determining the best path to take with those funds, which are going to likely represent a major portion, if not a majority portion, of their retirement funds one day.